The DHP lina Daybed and trundle is the optimal solution to small space living with an Ultra-Chic and minimalistic design. 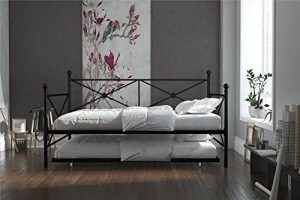 This metal Bedframe features an elegant design with crisscross metal, highlighted with a circular medallions and round finial posts. Available in classic Black and gold, it will compliment any interior. Crafted with a sturdy frame, the bed comes with metal slats that ensure stability and durability. Having guests stay over? this Daybed conceals a trundle that rolls out and creates yet another bed! accompany it with some duvets and soft throw pillows, and it will be converted into a comfy lounging for your living room. Maximize your living space with the lina Daybed and trundle! Weight limit daybed: 450 lb. Weight limit trundle: 225 lb. 2 beds for the price of 1!!! Very stylish!! !